Ham Radio Deluxe, a software suite for ham radio operators, become quickly popular among the amateur radio community thanks to the powerfullness of it’s features. Born mainly as a radio-control tool with the CAT commands interface, it has been joined by a complete log-book tool, and a complete multimode decoding/encoding system named Digital Master 780, and many other accessories like rotor control, mapping tools and interfaces to many ham-gadgets and tools. 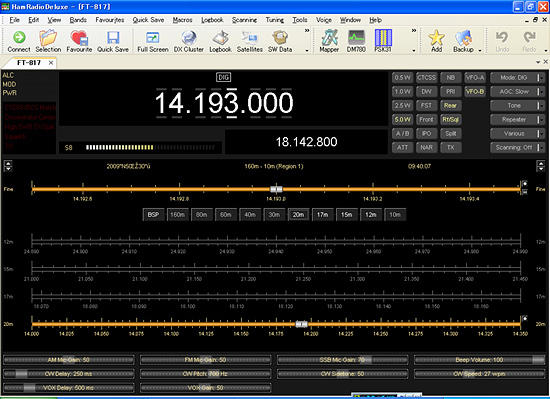 HRD permitted to many hams to open their windows to the digital modes, in particular to PSK31 and RTTY. DM780 is in any case an excellent CW decoder as well, and can operate in many other modes, like olivia, packtor, packet, SSTV and many many ham radio digital modes. Originally developped by Simon Brown HB9DRV, GD4ELI and distributed as a freeware,Â source code has been sold to HRDSoftware LLC Â that developed latest versions and release the new commercial version 6.